Can't find any amazing 25th birthday wishes that express what you want to say? You'll find one here. Since it's not every day that one of your loved ones turns a quarter century old, below are birthday messages for your 25-year-old birthday boy or girl that definitely rise to the occasion. More than anything else, turning 25 demands "significant" birthday message attention from you — and I don't just mean lots of attention or a large birthday greeting. I also mean that your 25th birthday boy or girl deserves "meaningful" attention, when it comes to the 25th birthday greeting you pick. 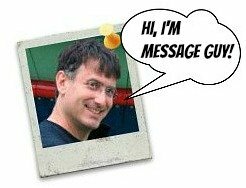 For more helpful hints on choosing the perfect birthday wish, refer to Message Guy Tip #10 before you start your search below. Congratulations, you have reached the ripe, old age of 25. Before you know it, you’ll be 30, 40, 50, 60, 70, 80, 90 and 100. Happy birthday, I guess! Congratulations! You've made it halfway through your 20s. Live it up the second half. Happy 25th birthday! Happy 2 dozen plus 1. Soon, you'll be 3 dozen minus 6...and 4 dozen plus 2 is not that far off. Start celebrating now! You know, birthdays are not a dime a dozen. 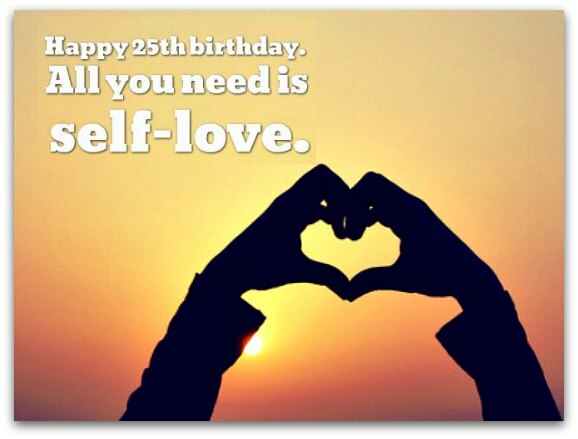 In the movies, your life (the one you've always dreamed about) starts at 25. In real life, you'll still be living with your parents at 25 (free of charge, so that's not all bad). Happy 25th birthday! At 25, something magical happens. You become a happier, healthier and richer person. Only great things start happening to you...if you want them bad enough. Happy 25th birthday to my favorite go-getter! Hope your 25th birthday is more than special. I hope it's extra, extra special, just like you and everything you bring to the world. Hoping every one of your long-held dreams and 25th birthday wishes come true today...and keep coming true your entire life. Happy birthday! Wishing you the best of the very best on your 25th birthday and, even better, every day of your wonderful life. Congratulations. From now on, you are officially old. Have a wonderful birthday! May you have the fortitude to withstand the next three quarters of your life. Happy 25th birthday! Happy birthday just isn't enough for you. So I wish you a breathtakingly beautiful, amazingly adventurous 25th birthday! Celebrate until your heart’s content tonight — you turn 25 only once in a lifetime. After today, the final countdown to 30 starts with a vengeance. Make this birthday count! Happy 25th birthday! Now you are closer than ever to your 30s, old man. Happy 25th birthday! Now you can say hello to the next three quarters of your life, otherwise known as your slow slide into either Michelle Pfeiffer or Susan Boyle style middle age. Take your pick! Wave goodbye to the first quarter of your life and look forward to the next three quarters of happiness, hope and prosperity. Happy birthday! There’s a way to make every day as incredible as your 25th birthday? Just live each day as if it’s your last. Happy birthday…and happy trails!